Upon scrolling through Lauralee Chambers Instagram account, one can immediately tell that she loves her job. She is constantly posting new and exciting projects, and readily engages with other like-minded educators in the form of positive comments or full on discussions. Like most of us, it seems like she enjoys sharing her work and being part of the dynamic online art education community, to the benefit of us all. LauraLee is in her 30th year of teaching. She currently is at two different schools, one K-2 and the other 3-5, just north of New York City. Before entering the public school system, she taught at various Catholic schools, and even had a stint in the human resources department at Pepsi Cola. She received a BFA in art education/art therapy and an MA in art education both from the College of New Rochelle. Be sure to stay updated on the wonderful things happening in her art room via her inspiring Instagram account. From looking at your content on Instagram, it seems like you are always coming up with new, original projects. I think that is so great to see, especially from someone who has taught for almost thirty years! Is this something that you are disciplined about, or is it a natural part of your teaching practice? Do you think it’s important for art teachers to challenge themselves with new projects, even if it often requires extra prep and the possibility of failure? My teaching is totally connected to the way I see the world. I see ideas everywhere and constantly search for new ways to infuse things into my curriculum. When I see something new, I wonder... “how can I teach this to my kids?” Once I try something a few times, I naturally change things up because I get bored easily and hearing myself repeat lessons is not fun, especially after this many years! I rarely repeat exact outcomes from year to year. I have 7 sections of 6 different grades so I find myself always wanting to add some kind of twist after doing it 3 times in a row. I love to alter something each time and yield a new result. It makes things harder sometimes, but I can’t imagine teaching any other way. It’s sanity-preservation for me! I encourage teachers to stay creative and open to change. Always keep your kids wondering! Instagram seems to be your preferred social media platform, and you use it with great skill. I also enjoy using it, but I’m curious to hear why you use it. From your perspective, what are its benefits? I appreciate you thinking I have great skill. I consider myself a newbie still and my grown children tease me when I ask them how to do things. My daughter actually encouraged me to start a year and a half ago because I love pictures and documenting. I had NO idea that so many people would be interested in what I posted. The greatest benefit I see is sharing with so many people around the world and staying motivated by everyone’s love for the same thing. I am the only elementary teacher in my district with no time to talk with my colleagues. IG is one way to be connected to a very supportive community of art teachers. The feedback is wonderful. Do you also think there is a negative side to it as well? In other words, with all the sharing that occurs, is there a form of etiquette that we all need to be mindful of as educators? Of course. We all need to be respectful of the time and energy others put into their projects and be mindful of why we are sharing our lessons. We don’t really know who we are reaching and where content goes. We can’t follow every art teacher. Sometimes things show up on someone's feed as if for the first time. New teachers may not realize that what they are sharing has been around for years! So it’s tricky, but we all know when something is not our own. When people copy and share without giving due credit, it hurts us all! Sometimes it’s an innocent mistake and sometimes it’s a repeat offense. Let’s try to be responsible. I like to use IG as a connecting tool to get to know other teachers and their art so we can have conversations about how those lessons work. It’s also really nice to just see how people are doing. We all have a story and it is often hidden behind the gorgeous images. We really are here to lift each other up! Do you make your own art, and if so, do you think it is important for art teachers to create their own work? Yes, I sure do. Creating is my North Star. It keeps me grounded and quiets my anxiety, even when I only have time to doodle! I keep an idea book with me at all times and have art supplies on every table in my house. I love watercolors and colored pencil because they are always new. Art teachers need to create outside of their art rooms to feel complete and I do think it’s important to continue that process of exploration in whatever way works best. We are born makers! Sharing personal art with my students helps them to see behind the scenes and realize we are not magicians. It’s important for them to see our process, otherwise they might think it’s out of their grasp and it’s NOT. You shared with me that you teach over 900 students between your two schools, that they are on a 7-day cycle, and that classes are 45 minutes long. Without having to do the math, it seems like you have a lot of ground to cover in a short amount of time! How do you navigate this challenge? Do you feel a lot of pressure to have students on task and finish projects on time? This year is a true challenge as the 7 day cycle is new. I have about 930 students! 41 rosters. A crazy amount. I am a bit worried. I have to be super organized logistically and will have to change some things as I will see my students less. Most often my kids have to wait about 10 days to return to a project and that is truly difficult for me and them! I do feel great pressure in trying to complete things in only one class because that is not how real artists work at all. Carrying lessons over will slow down momentum and delay our ability to display work. I can only continue to do my best, go with the flow and keep my kids happy when we are together. That’s really the bottom line. You also shared with me that you have your own classroom at each school. On the one hand, that is really awesome and much better than one of the alternatives (art on a cart), but on the other hand, wow, that is a lot to maintain! It takes so much energy to set up and keep one room organized and clean. I can’t imagine being responsible for another one. On top of that you are displaying artwork in the halls at both schools. How do you manage all of this? Do you ask for a lot of parent volunteers? This is my 7th year at two schools. Before that, there was a K-2 art teacher. I ended up taking over her spot. The wonderful thing about two schools is that I know all the kids! They know me and my expectations, as we are together for 6 years! Setting up two rooms takes time, but I have it down to a science and I prefer a simple clean look. I went through the early years of buying a million extra things and going a bit too crazy and I’ve cut back and always reflect on what the kids really need, not what makes the room look good in a photo. My displays have changed drastically over the years. Before working at 2 schools, I created museum like floor to ceiling displays and loved it! I simply don’t have that kind of time now. I try to display things that can stay up longer and hang big collaborative pieces or things with a theme. I am not good at asking for help! I am never in one place long enough to have parents work with me. I also have been doing Artsonia for about 8 years and I am not sure I can continue that at the same rate now. It’s not hard to see that you work hard at what you do: maintaining the social media account, going back and forth between two schools, developing new lessons, etc. How do achieve a work-life balance, if that can even exist? I have always been organized, a list maker, and a goal setter. That keeps me on track most of the time. I am also fortunate to have a patient husband with a flexible schedule. Two of our three grown kids are living away this year so there’s less laundry and cooking! There are no more dance performances or baseball games sadly, so I have some time to spend on things I love. Work is the demanding part. I’m feeling beat at the end of my day, so I reward myself with candy! Sometimes I find balance by just walking away. At some point, it has to be enough. You have to give yourself a break. I have difficulty letting go, but you know when you have given your all at home or at school, and you just need to take care of yourself and let someone else pick up the pieces. Trust your gut. Be yourself. Get to know your kids and what they really need. Always put them first and welcome them at your door! Reflect on your teaching and find ways to streamline so that things flow easily. Befriend positive, passionate colleagues and learn their secrets. Always have a few tricks up your sleeve. Expect the unexpected everyday. Be kind to yourself, learn to let go and have fun! Who are a few art educators that you find particularly inspiring? Cassie Stephens has been the most consistent, original and generous art teacher I have ever know. We deliver the same messages to kids in different ways. She has been inspiring me for years and we are ALL blessed to have her as a constant source of creative energy and fun! Nic Hahn has been another long time role model. Mini Matisse is always on the cutting edge, incredibly clever, thoughtful and creative. She is all about collaboration and creates engaging unique ways to include teachers. A new inspirational friend is Kaitlyn Edington. She is an extremely talented and versatile artist and art teacher. I love her big heart, her classroom vibe, and the gentle yet direct way she works with her students. I always look forward to her gorgeous feed and cool ideas! What are a few favorite lessons that you teach? Why are these your favorite? My favorite lessons are those that are rich with possibility and that allow students to think of ways to go above and beyond my teaching. We also need to always consider developmental levels when choosing our lessons. I love a good bleeding tissue paper lesson for any grade level because the dyed base has tremendous possibilities for what to add on top of it and the loose pieces that fall off are definitely reusable. You can’t go wrong with all that color. This is a favorite 3rd grade lesson using watercolor paints on diffusing paper. Every child is successful and delighted at the way their colors “play” together! I love this 4th grade lesson because it combines so many important artistic habits with technique- size and placement, color and design, shading, fine motor control, problem-solving, attention to detail, stamina, and much more. Oh assessment? not a strength! I’m too busy learning everyone’s name!!! I know you won’t believe it but I do have to grade 930 students and it ain’t easy! I keep a folder with each class that comes to me in a given day and I have rosters and photos in there. With my K-2 kids, I walk around the room and jot quick symbols and notes next to their names while they are working, when I remember. In my 3-5 school I use games, quizzes, and creative play as my assessment in addition to their art work. I am not sure that our current art grading system matters to parents and I imagine there must be a better way! Unfortunately, with my load, it is not a priority in my art rooms. I do not have the time to devote right now, but I do believe students should be exposed to the riches of this avenue to art for sure. I wonder if other art teachers can relate to the concept of being valued in your districts. I have been fortunate to work for prior years with leadership who put the arts and children first, and that is not always the case. Times have changed. Budgets get cut, and schedules become unreasonable. There are more demands with less support and sometimes we end up feeling like coverage instead of essential teachers. It feels bad. We must however, always continue to do what is right for the children. No matter what. I’ve learned to ask for what I need and keep moving forward. Don’t be afraid to use your voice and share concerns. I try to stay grateful and focus on the fact that I am giving my students a gift they will have forever. Teaching for Creativity is back on the radar along with the importance of play. LOL not really new! Teaching this long, you see things re-packaged like STEM/STEAM. Art teachers have been doing that forever… Maker Space? that’s always been the art room!! “Should we be teaching art, or teaching students to think like artists?” What is the purpose and value of Art education in the 21st Century? As Cindy Meyers Foley states: “Art’s critical value is to develop learners that think like Artists which means learners who are creative, curious, that seek questions, develop ideas, and play. For that to happen society will need to stop the pervasive, problematic and cliché messaging that implies that creativity is somehow defined as artistic skill.” What do you think? I completely agree. I love that quote. I often hear that kind of messaging from well-meaning adults who say things like, “I can’t draw a stick figure”, or “I was never good at art”. If kids are hearing those messages from adults, which they do of course, they are going to ask themselves whether they are good or not. They view it in such stark, black and white terms. As a result, when students encounter a challenge or fail at something in art, they come to the conclusion that they are simply not good. Like you, I believe that one of our jobs is to counteract this type of messaging, which they hear in different forms from different sources. Successful artists and designers know that good art is the result of perseverance and hard work, and rarely the result of a special gift one possesses. 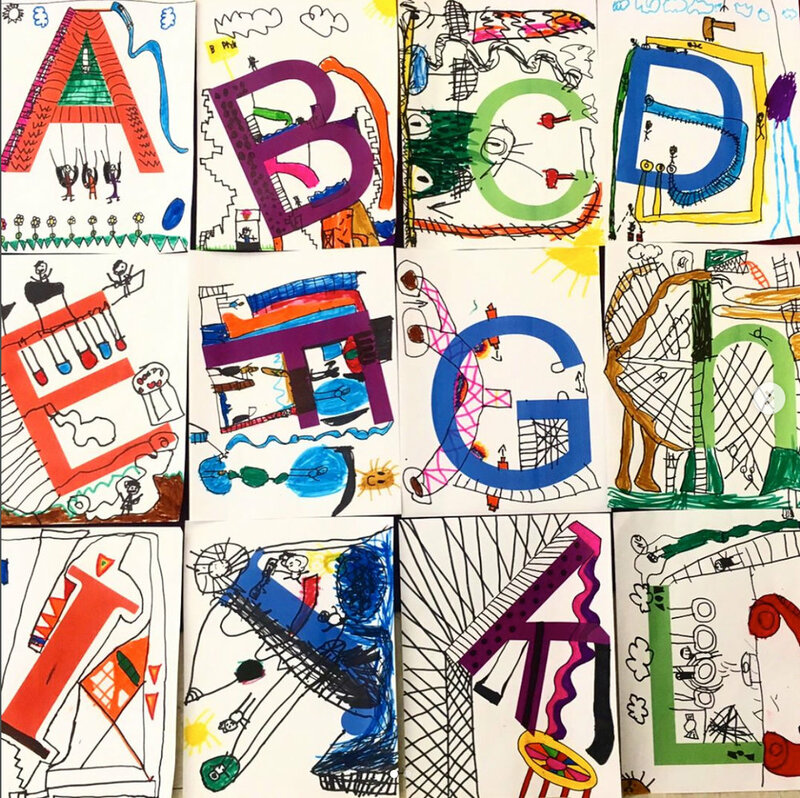 In my view, focusing on how to think like artists—planning, sketching, working through problems, and continuing after failing— is the best way students can be independently creative. Go back and read my first answer!! I hate the idea of a script or anything that sounds inflexible, especially in the arts. It just doesn’t work for me. I would feel extremely confined if I had to follow an established curriculum. I would find ways around it or end up going crazy. I don’t like the idea of a one size fits all anything. Art is not defined like that. It is much more ambiguous and needs really open ends. I focus on the kids in front of me and what they need. Some people think artists are “out of the box” thinkers. I think artists don’t even see a box. We certainly don’t want to be put in one.